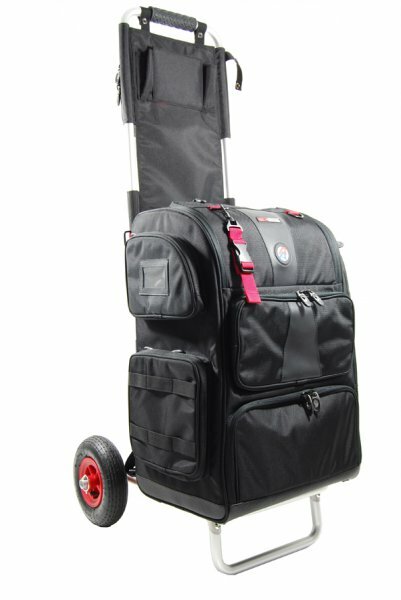 Bundle - range pack pro and DAA range cart. Perfect combo! Makes everything easier during competition, instead of using regular range bag. Prevents sore backs and other potential mechanical injuries. Awesome. No more sore arms or not having anywhere to put things. Robust and well made. Love my new Range Pack Pro and Range Cart Pro. Very functionable , it's great to have all my equipment easily accessible specially when I'm at competitions . I would highly recommended it. An excellent bag. High level of quality. Very satisfied. Thank you very much. I have watched my friends in envy and finally took the plunge. Why did I wait so long ??? What an awesome product !!! Awesome bag. My wife got me this bag for the holidays. The price is steep but the bag screams luxury and versatility. I can store multiple firearms and a midget to clean them after I'm done shooting them. Awesome bag. Super clean. Beast of a bag. Great bag and cart combo my wife and I don't need to carry a bag each anymore fits all our equipment and guns would highly recommend it. Dear Friends of Double Alpha. Manifesto my compliments for the professionalism and promptness in relation to meeting my request. As well as congratulate the quality of the goods supplied. I will continue buying. Everyday this Range bag just keeps on impressing me. They thought of everything. Besides my Dillon reloading set, this is the best item i have bought from Double Alpha or any other company!! What a pleasure doing business with you! Save over 5% when ordering your RangePack Pro together with a RangeCart Pro trolly. Easily the best purchase for my competition equipment. Traveling across state or staying local this bag will have everything you need plus more. Easily holds all ammo, mags, parts, tools, guns and other required devices. 3gun or steel challenge with 2 rifles i use the drago double gun bag. I put the shoulder straps across the handle and the cart holds up with ease. No more back breaking matches with trying to carry everything around from stage to stage. Its pricey, but your back approves!! It took me a while to convince myself to spend the money for the Range Cart Pro but I'm glad I did. I added a big golf umbrella and small section of PVC pipe to hold the umbrella a bit higher so I could actually get under it and now it has everything to keep me comfortable at long matches. Another change I made besides the addition of the PVC pipe for the umbrella was shortening the front support leg of the cart. The front support leg seemed to be too long and would cause the cart to lean back making it unstable. Even with the bag attached it had a tendency to fall over; especially with the umbrella open. One issue; that is very minor, is the hydration pack supplied with the bag didn't actually allow water to flow through the spout. I cut a slit in the mouth piece but it still seems like there in no hole in the tubing to allow the water to flow. I still haven't figured that one out yet. The 7 magazine pouches inside the bag are very conveniently located but the hook and loop attachment struggles to stay in place with 7 loaded magazines installed. I would personally like a more permanent attachment because I've opened the bag several times to find loose magazines all over the place. There are just a few things that I would personally like to change about the setup but all in all it is a great bag with great features. New style cart is different from older style and tires rub the bottom corners of the bag. 2 weeks in and I had a hole in my brand new mag. Management was kind enough to issue a replacement but I had to jiffy rig my cart with something to push the bag away from the tires. I love the setup but not so sure I would have bought it knowing that this was an issue. For $300 I wanted a setup ready to go and didn\'t want to tinker with it like I would expect from a $50 cart which most the guys are using. [DAA reply]: We have since made a small adjustment so this does not occur. All I can say is WOW. This combo is amazing, so much has been thought of, which is very rare in products today. This thing has been designed down to the last detail. I cannot wait to get it up to the range, and all the oooh's and aaaah's it will receive. And then when I pull the hose out for a little hydration....very impressive. Good work. God this thing is heavy, then again you just can't not pack it full of all the stuff you'll ever need with you on the range. Me and my brother use it to pack our 2 guns and all the ammo we'll ever need plus all the other gear and items you would want. The thing is really as easy to keep organised as they say. I would recommend it to anyone yet if you're only going to use it for yourself you would probably not need the large one. You only pack more stuff that you don't end up using anyway. PS. the cart is a lifesaver, don't get the pack without it! Just recieved and assembled the cart. All lloks good. Can't wait for Sunday when i go to the range with this cart. The bag is great, i packed all my stuff in and there is still so much space for my snack, etc. No more cramming stuff into my old range bag as my stuff is so much more organised and plenty of space available. Great product!